By virtue of its amazing and elegant engineering, the recognition of the historic architectural value of the Ralph Munroe Miami Marine Stadium marks a milestone in Miami-Dade historic preservation. 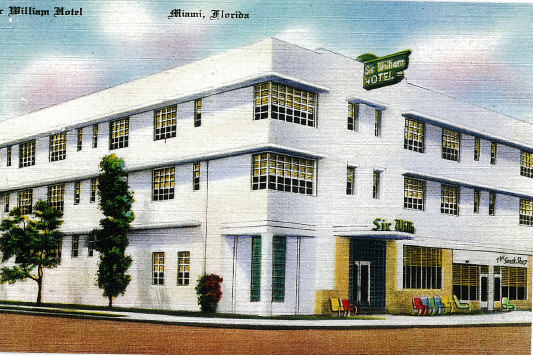 By now the MiMo architectural wonderland of modest motels along Biscayne Boulevard between NE 50th and NE 77th Streets, designated in 2006, has become Greater Miami’s hippest historic destination. 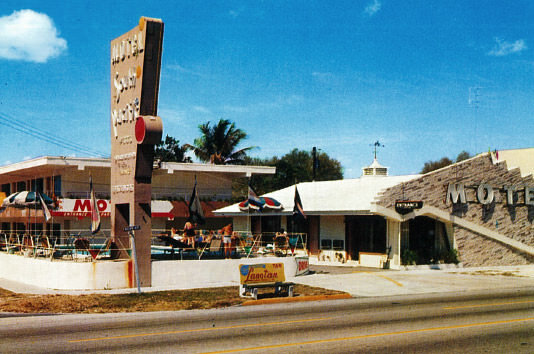 More recently much of North Beach was placed on the National Register by virtue of its large and fine ensemble of Mid-century Modern neighborhoods and landmarks. 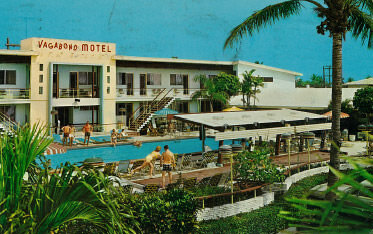 The latest milestone in the official recognition of Miami-Dade’s treasure trove of Mid-century Modern architecture has been Miami Beach’s designation of the Morris Lapidus / Mid-20th Century Architectural Historic District encompassing such globally-recognized icons as Lapidus’s Fontainebleau and Eden Roc hotels, as well as several of his condominiums including the Crystal House and two of the Seacoast Towers. Other local Mid-century master architects such as Melvin Grossman and Charles McKirahan are also represented in the district, increasingly referred to as the MiMo Palisades, to distinguish it from the Condo Canyon adjacent to the north. This landmark and these districts illustrate the great variety and richness of Greater Miami’s Mid-century Modern legacy. After all, the Post-World War II years were an extraordinary time in American history and it was a period of great expansion in Miami. Only 54 years-old in 1950, Greater Miami was destined to be the American metropolis with the greatest proportion of 1950s and 60s architecture. The period’s advances in industry, technology and affluence are written across the cityscape. By 1950, the war effort had retooled to serve the consumer and churned out automobiles for nearly everyone. Miami responded with the motel strips of Sunny Isles, and Biscayne Boulevard. 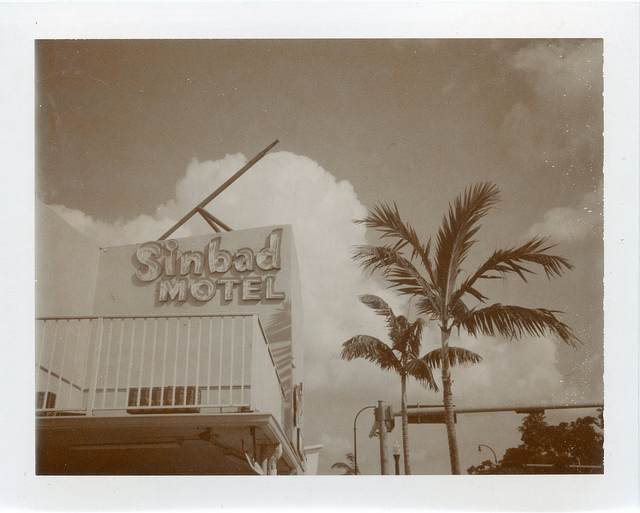 While the Sunny Isles motels are mostly a memory one can still imagine how the MiMo motels of Biscayne Boulevard, or “BiBo,” beckoned to weary drivers arriving in the Magic City after long trips from the north. At the other end of the spectrum, advances in engineering and construction technology made possible such landmarks as the Marine Stadium and the late-great National Airlines Nose Hangar building at MIA. Late in the period and now mostly gone, came John Andrews cruise ship terminals at the Port of Miami. The concreter roofs Andrews designed greeted the passenger at a human scale, but soared like cresting waves toward the moored liners. While we tend to separate such daring feats of engineering like the Marine Stadium from Lapidus’ extravagant hotels and then again place the little motels of Biscayne Boulevard in their own category, they are all tied together by the inspiring abilities of modern materials such as steel, reinforced concrete, modern construction methods and generous budgets, to create spaces and volumes that were ground-breaking. As Thomas Hine so eloquently points out in his seminal book, Populuxe, Morris Lapidus revolutionized the arrangement of interior space through his knowledge and use of the very same modern materials and engineering that respected architects of the time were extolled for, through more academically accepted designs. While Mies van der Rohe’s SeagramBuilding and the Fontainebleau may appear like night and day, they both were unthinkable without, and they both, in their own way, celebrated 20th century advances in materials, engineering and construction technology. Aesthetes of the period couldn’t see past the antiques and the decoration that Lapidus employed to make his hotels feel like “no place like home.” The difference between respect and derision, as Lapidus so succinctly stated, was that he designed his hotels not for architects, but for people who learned about architecture from the movies. In Lapidus’ hotel lobbies, interior spaces, instead of being separated by load-bearing walls, flowed almost imperceptibly from one to the next. It was devices such as lighting, planters with bean-poles, and changes in elevation that modulated his interior spaces. The broad sweep of his hotel interiors were made possible by the same marvelous engineering that allowed Hilario Candela to create the soaring roof of the Marine Stadium. 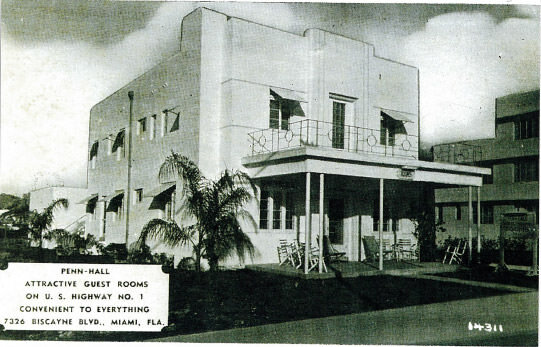 Meanwhile, over on Biscayne Boulevard, architects inspired by this dynamic architecture created a poignant local vernacular of version of it in much the same way the architects of the pre-war Art Deco District created a local vernacular version of big-city, high style Art Deco. 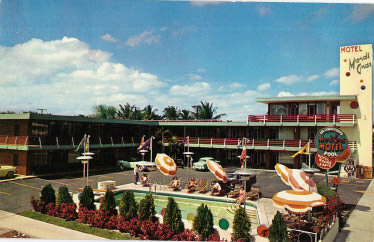 The triangular glass volume (now enclosed) over the reception of the Biscayne Inn recalls the soaring lobby space and sloped roof of the Admiral Vee Motel at 80th & Biscayne, which in turn bears a clear resemblance to the Venezuelan Pavilion at the 1939-40 New York World’s Fair, The World of Tomorrow. After the war and the retooling period, the World of Tomorrow would go on to have a great impact on the 1950s. In a twist on the theme of vernacular imitation, the 30′ cylindrical glass aviary, now long gone, at the Audubon (now part of the Davis) echoed the alligator-filled inverted, conical atrium of Lapidus’ recently demolished Americana in BalHarbour. As the drive-in-screen-size picture of Miami-Dade’s Mid-century Modernist legacy comes into focus, the importance of officially recognizing what many around the world already assume to be the case becomes more essential. A great gap in the spectrum of protected, priceless MiMo including the Marine Stadium, the motels of Biscayne Boulevard and the multi-family neighborhoods of North Beach has been filled with the designation of the Morris Lapidus / Mid 20th century Architectural Historic District.